Thought that all F1 testing was banned this year? Well you’d be wrong. Turns out teams are allowed straight-line testing only in order to test aerodynamics. For exactly this reason, the Renault F1 team rolled up today into the Imperial War Museum at Duxford, Cambridgeshire, which conveniently has a 1.5km runway to zoom up and down on. Duxford is a fairly impressive place at the best of times, boasting a Concorde, a RAF Harrier, a U2 spy-plane and even a B-52 bomber. However, today’s star attraction was something much slower and it didn’t even fly. 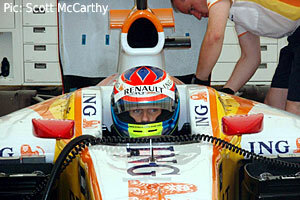 Renault had brought along two large trucks and assembled a makeshift garage which was basically a large marquee. Inside was the #8 R29 with Romain Grosjean in the cockpit. More on the possible significance of that later. It wasn’t long before my eardrums were bleeding with the fantastic sound of a F1 engine firing up. A quick check that all four tyres were attached and Grosjean drove out of the garage out towards the end of the runway. What followed were a series of blasts up and down the runway before returning to the garage. After a brief queue we were allowed to stand right in front of the garage and take several photos. I took the opportunity to do just that, and also have a few words with anyone in a Renault jacket I could find. Grosjean in, Piquet out? Looks that way. I spoke to someone who described himself as deputy head of development although I didn’t get his name. I asked if Nelson Piquet Jr would be racing wherever Renault were next allowed to race (they’re currently appealing against the decision to exclude them from Valencia for allowing Alonso to drive a three-wheeler). The answer was: “Well, it’s no secret Flavio and Nelson have had a very public falling out, and Romain is here today when Nelson was originally supposed to be”. Draw whatever conclusions from that you like, although I read it as Piquet’s out, Grosjean’s in. The only other news I managed to get was the general ill-feeling towards the FIA. In particular the FIA’s pursuit of KERS, which has cost most teams far in excess of the £40m budget cap proposed for next season, on what is a mostly ineffective component that is going to be thrown away for next year anyway. The team were testing various new pieces for the car which they hope to use in Valencia or Spa. The car was kitted out with a few extra aerials and sensors to capture as much data as possible, and to allow them to compensate for crosswinds and so on. These low-key testing sessions are an excellent chance for fans like myself to get much closer to the cars than you would ever get at a race. And while you don’t get to see much in the way of track action, the chance to chat with mechanics and team officials is well worth it. I’ve no idea if the testing will help Renault get any quicker, but we might just have more of an idea as to who will be driving in car #8 at the next race. Hi Scott, Great job. I’m a passionate fan of F1 and the technical involved in it. I collaborate with a F1 Spanish forum and I would ask you if I could use the photos you did, of course I wolud put the link to your webpage. I’ve just replied via e-mail, but I’m fine for you to use the photos from my website providing you credit me as the photographer. Thanks for asking in advance, appreciated. Hi, the news is very interesting, and i would like to use your photo too? if i can’t contact me. I let of course your name and copyright. The pics will be available on fan-f1.com (french website). Only just saw this post now, good job guys! At least, 50% of the bet it’s yours, ji, ji. By the way, talking about Aerotests, Pedro de la Rosa during the races, often says that they (he and McLaren), carry out aerotest in a french airport. Do you know the placing of it? 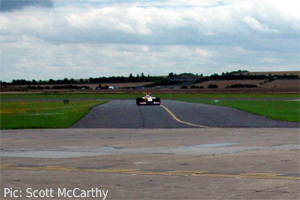 Categorised under F1, tagged under Duxford, F1 testing, Formula One, Nelson A Piquet, Renault F1, Romain Grosjean.